The 28.32 metre motor yacht My Zehava has been jointly listed for sale by Vassilis Fotilas at Fraser and Niso Gadot at Azimut Yachts Israel. 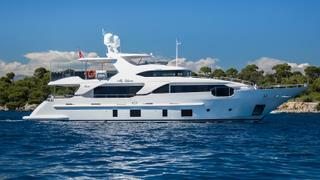 Launched by Benetti in 2014 as part of the Italian yard’s Defino 93 series, this raised pilothouse yacht was built from a GRP hull and superstructure. Exterior styling is by Stefano Righini, while Carlo Galeazzi created the crisp, modern interior décor, working in close collaboration with the owners. Accommodation is for ten guests in five spacious en-suite cabins, including a master suite, two doubles and two twins. Meanwhile, the crew quarters allows for a staff of up to four people. Twin staircases lead from the bathing platform up to the sheltered cockpit with its al fresco dining space, which is comprised of a rectangular table, six freestanding chairs and built-in bench seating. The open-plan saloon of this yacht for sale features an informal lounge area that flows seamlessly into the main dining area with its rectangular table that can easily seat up to ten guests. Al fresco relaxation options include a foredeck sunbathing area and the sundeck, with further outdoor dining shaded by a hardtop Bimini. Additionally, the aft garage provides storage space for a RIB tender and a Jet Ski. Power comes from a pair of 1,000hp MTU 8V2000 M72 diesel engines for a top speed of 13.5 knots. When trimmed back to her cruising speed of 12 knots, she boasts a maximum range of 1,500 nautical miles, drawing on a total fuel capacity of 16,000 litres. Currently lying in the South of France, and also available for charter through Olga Ekiert at Fraser, My Zehava is asking €6,200,000.